Minimally invasive aesthetic procedures are important, routine techniques in dermatology. However, both Dermatologist and Plastic Surgeons are becoming more willing to explore and use these techniques. Overall the use of these procedures continues to expand in both fields. In this sense, minimally invasive cosmetic and aesthetic procedures is established as an interdisciplinary topic -- of significant interest to both medical specialties. This book addresses the needs of both these specialties in a practical and clinically applicable way. This title provides a comprehensive overview of the most relevant and widely used minimally invasive procedures, presented in a practical and straightforward style. Rather than a broad overview of the literature, this practical title offers a step-by-step guide to clinical procedures. Each chapter addresses a single clinical procedure, discussing its theoretical basis, the materials needed, the methods and specific techniques involved, clinical follow-up, and before-and-after pictures. 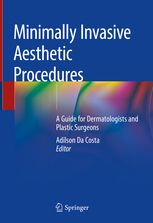 Minimally Invasive Aesthetic Procedures: A Guide for Dermatologists and Plastic Surgeons is a practical manual for all dermatologists and plastic surgeons interested in the expanding field of aesthetic medicine.